This lovely village is found to the south of Salamanca province, declared in 1975 a Historic Artistic Site it offers visitors a place to spend their time surrounded by an impeccable landscape, worth visiting. To visit we can leave the car parked in the vicinity of the village, in the free public parking that is signposted. The streets of Candelario are steep, full of fountains, cobbled streets that lead us corner after corner through narrow streets, confined by houses of no more than 3 floors, with wooden ceilings and doors. Something curious that can be observed in the homes are the half external doors, placed in front of the entrance to the house that are called batipuertas. Some say they are stop snow entering in winter, but knowing the cured meat tradition of the town, the more likely theory is that the batipuertas serve so one could work in daylight whilst stopping animals attracted to the smell from entering. This beautiful town seems to have been touched forever. It is located on a steep slope that has turned its streets into labyrinthine and made its plazas smaller. Owner of a very particular architecture, the houses of the village are narrow and have three floors. This is because Candelario has always been associated with the ham and sausage industry, and the top floor of the house was used for the drying of pork products. Another nice touch is the 'batipuertas', a type of door that is still rife in the village, preventing access to animals but allowing that of light. 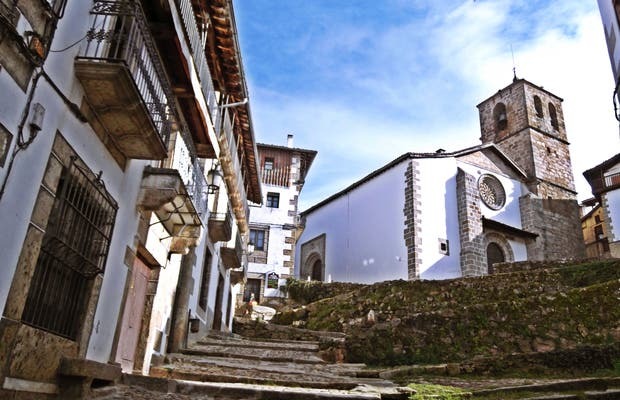 Candelario is the starting point of many trails through the mountains, as well as being a few kilometres from the ski resort of La Covatilla. This attracts many visitors, although large percentages only come to walk around and purchase the excellent hams and sausages. Café - Bar "La Sierra"